Why Magpie? Because I like observing these sleek birds with a tapering tail. 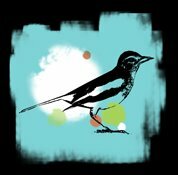 And like Magpies, I live with the burden of being a 'chatter', even though I believe that I am rather shy, reserved and unobtrusive :). MPA's Cover of the Year award 2007 goes to September 11, 2006 cover from The New Yorker. 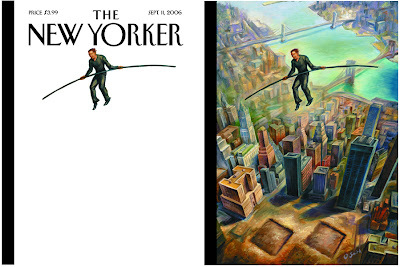 For the five-year 9/11 anniversary cover, John Mavroudis’ concept was to stay away from the surfeit of images that recall the horror and remember the wonder of Philippe Petit’s 1974 tight-rope walk between the towers. The result in Owen Smith’s painting is magical: the walker, in the absence of towers and rope, remains suspended in the white space of a blank page. The two-part cover (a first for The New Yorker) is a memorial to the spirit of humanity and those who died there, and especially to the man who did a perfect dive as he plunged to his death. You can see winning covers and finalists, and read the stories behind them here.